Published: Jan. 3, 2014 at 08:37 p.m. Updated: Jan. 4, 2014 at 03:07 p.m.
Are the Cleveland Browns set to make a play for Bob Stoops? NFL Media Insider Ian Rapoport said Friday on NFL Network's "Around The League Live" that the Oklahoma Sooners coach could be a potential target as the team seeks to fill it head coach vacancy. The interest might be mutual. Rapoport has been told Stoops is more open than ever to the idea of jumping to the NFL. On Thursday, Stoops' Oklahoma team pulled off an upset victory over Alabama in the Allstate Sugar Bowl. The Youngstown, Ohio, native was asked about NFL rumors after the game. "You never know," Stoops said, via ESPN. Stoops has a 160-39 record at Oklahoma. He is the only college coach to win the Sugar, Orange, Rose and Fiesta Bowl. He received a contract extension this summer that takes him through the 2020 season. The Browns attempted to make a splashy hire out of the college ranks last year, when they courted Oregon coach Chip Kelly. The coach turned the Browns down and took a job with the Philadelphia Eagles. 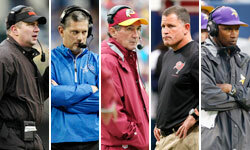 Broncos offensive coordinator Adam Gase, New England Patriots offensive coordinator Josh McDaniels, Arizona Cardinals defensive coordinator Todd Bowles and Seattle Seahawks defensive coordinator Dan Quinn are other Browns options to replace Rob Chudzinski.